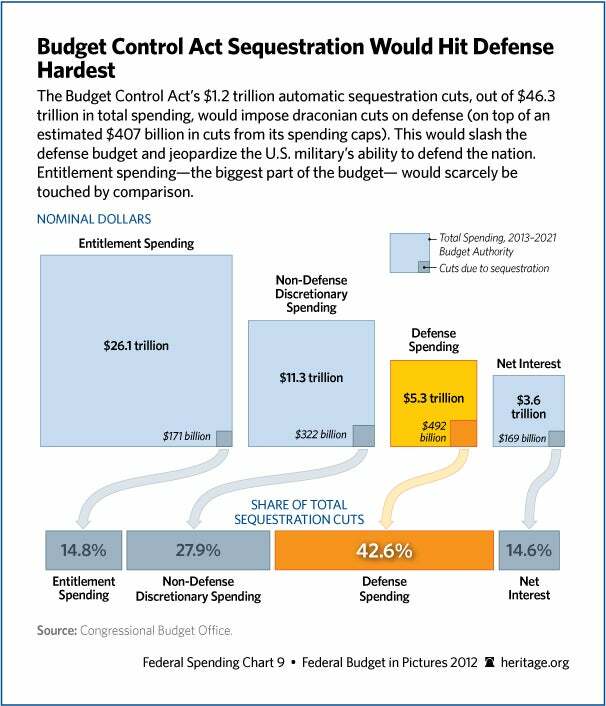 Unless Congress acts, March 1 will trigger a $55 billion-per-year ($43 billion in 2013, as the fiscal cliff deal delayed the cuts for two months) cut in national defense, known as sequestration, which will weaken the United States’s ability to defend itself. But this does not have to happen; Congress should cut other spending to prevent the debilitating cuts to defense. [Sequestration] was designed to be so onerous as to bring Congress to its senses—making rational budget reduction proposals—before sequestration occurred. Yet only one chamber of Congress responded.… Many of the proposed reforms and reductions are long overdue; others were developed in the House reconciliation bill that aimed at replacing the sequester…with alternative savings, including in entitlement programs. Congress could draw from a list of commonsense proposals that save $150 billion in 2013 to find at least $55 billion in spending cuts to avoid a devastating impact on defense. Rescind unspent funds from Obama’s ineffective stimulus bill, saving $31 billion. These are only five examples of the spending cuts proposed by Knudsen based on The Heritage Foundation’s Saving the American Dream plan. In addition, billions of taxpayer dollars could be saved by taking steps to reduce as much as $115 billion in waste, fraud, and abuse in programs like the earned income tax credit, Medicare, and Medicaid. In the long run, it is far more fiscally responsible to keep America’s defense strong than to allow short-term cuts to cripple our military capabilities. It helps keep the peace, protecting American families and facilitating economic growth. Allowing the military to atrophy, on the other hand, and then rebuilding it costs more than responsibly maintaining defense spending at adequate levels in the first place. 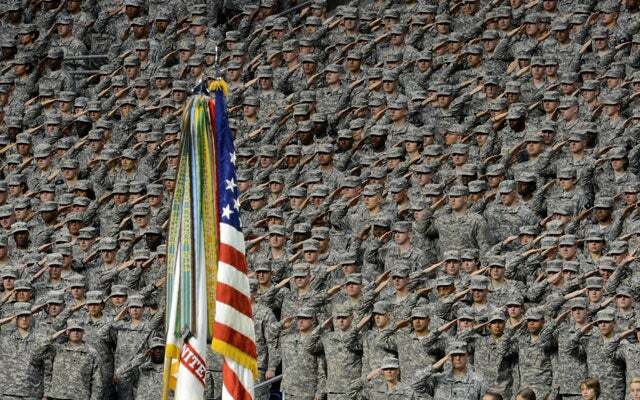 Unless President Obama and Congress take action to save the military from the broadsword cuts they created, America will set itself up to pay the price for irresponsible cuts in the future. Instead, Congress should select the necessary $55 billion to offset sequestration of defense from the $150 billion of proposed cuts to inappropriate and wasteful federal spending. Elliot Gaiser is currently a member of the Young Leaders Program at The Heritage Foundation. For more information on interning at Heritage, please visit http://www.heritage.org/about/departments/ylp.cfm.